Dr. Robert K. Lee is board-certified podiatric surgeon who offers comprehensive diagnosis and treatment for ailments affecting the foot and ankle. 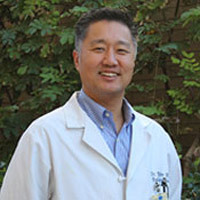 Dr. Lee is the current Chief of Podiatric Surgery at the UCLA Medical Center, Santa Monica. He is also the current President of the Los Angeles County Podiatric Medical Association. He grew up in Southern California, graduated from college in U.C. San Diego with a B.S. in Microbiology, before attending the California College of Podiatric Medicine in San Francisco and graduating with honors in May, 1999. He continued his training at a three year surgical residency in reconstructive foot and ankle surgery at the INOVA Faifax Hospital in Northern Virginia before completing his training with a Lower Extremity Diabetic Limb Salvage Fellowship at Georgetown University Medical Center in Washington D.C. In addition to being proficient with surgery of common foot conditions such as bunions, neuromas, and hammertoes, he also has a special interest in diabetic limb salvage, Charcot foot reconstruction, and hindfoot and ankle surgery. Patient appointments can be made in his Westwood or Santa Monica clinics, or the UCLA Center for Wound Healing.